On the way to Lake Mahinapua we stopped along the Tasman coast to check out the Punakaiki (pancake rocks) - and again you guessed it - rocks that look like pancakes. Straight to the point - I love it! So the pancake rocks are a series of stratisfied limestone stacks that over the years have eroded to give the effect of giant piles of neatly stacked pancakes. On the bus we were told that there would be a fancy dress party tonight and that the theme would be P-Party(come as anything beginning with the letter P) talk about short notice! 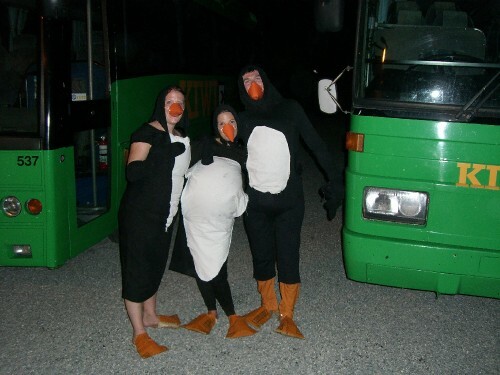 We decided to go as penguins. We stopped at Greymouth, where we had one hour to get anything we needed. It was just a mad charity and pound shop dash to find anything black or white, but we managed to get everything we needed. Our accommodation tonight was a completely random, middle of nowhere stop. The guy that owned it was this 82 year old, bearded man called Les. 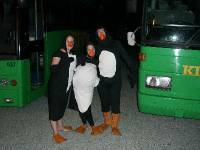 Who still at 82 insisted on throwing a big dinner and fancy dress party every night for a busload of kiwi experience passengers. He was hillarious. On arrival at the lake we had just over an hour before dinner to get our costumes together. As you can imagine I was in my element. We had a load of cardboard and orange paint to make our feet and beaks. Then we made some black hoods and each sewed white chest pieces on our black clothes. Before long word had got round about our designing/making talents and soon we had a workshop going, helping anyone from pirates to pandas - even a pink poodle! Our costumes looked awesome - check out the photos. No-one could believe we'd done what we did in the time. We did stand out as putting in rather more effort than anyone else - 3 designers tho -we can't help ourselves! Had a rather restricted night. the nature of the feet meant we actually had to waddle like penguins just to get along and trying to hold a drink with a sock over your had is not easy - neither is trying to drink with a beak on. Dinner was delicious and the afterparty was hillarious. We even got nominated for the best costume, but as there was 3 of us and only one prize,, it was decided that we couldn't win. Instead our friend Jonny - the panda won. He deserved it as spent the whole night carrying around a massive tree branch. Good times.